public works will be part of this new exhibition by Price & Myers, our collaborators on the Last Chair Arch for High Wycombe. The New Art of Making, a free exhibition which explores digital craftsmanship, curated by Futurecity in partnership with Price & Myers' Geometrics, will open in The Gallery at Foyles, London, from 11 December 2015 until 7 February 2016. How we build our world is changing. A revolution is underway in making and building art and architecture, with technology now allowing us to create and make with an unprecedented freedom. At the centre of this change is the 'designer-maker'; a cross-disciplinary master craftsman, who fuses sophisticated digital design tools and computerised fabrication with industrial, architectural and engineering expertise to define new ways of working with traditional materials - wood, stone, steel and glass. This emerging practice is digital craftsmanship – a radical new practice of rendering sculptural form, blurring the line between artist, designer and maker. It is an approach pioneered by Price & Myers' Geometrics team, and supported by Futurecity through an innovative approach to commissioning art in the public realm. The New Art Of Making exhibition realised by Futurecity and Price & Myers Geometrics, charts the evolution of digital creativity and fabrication over a sequence of recent collaborations featuring key groundbreaking projects and major sculptural commissions. Advances in computer-controlled fabrication have closed the gap between the drawing board and the real world. The development of advanced digital design and production techniques means that instead of constructing our buildings, bridges and sculptures from a set of pre-defined pieces - bricks, girders, windows - we can now manufacture our own lego® kit for each and every project. By designing each piece specifically to the project requirements, we can minimize wasteful mass production and create almost any shape imaginable. Buildings become sculpture, and sculpture is set free to explore form at the limits of imagination. Located at the point where architecture, engineering and fabrication converge with digital technology, Price & Myers Geometrics' team of specialist engineers and architects exemplify this new model of 'digital craftsmanship'. Together with visionary placemaking agency Futurecity, and working alongside pioneering artists and architects, the practice has delivered a diverse range of cutting-edge sculptures and architectural commissions across the capital and farther afield. 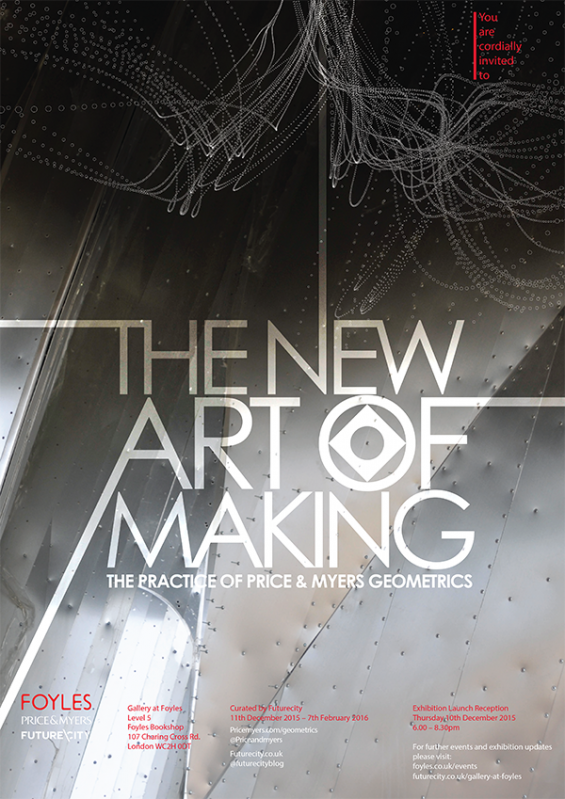 'The New Art Of Making' exhibition explores the theme of digital craftsmanship via a series of projects which range in scale from a chair arch in High Wycombe by public works, to a 12m aluminium vertical shell artwork, a stainless steel bridge in Bristol and a new pier building at Southend. It culminates with the digital craftsmanship embodied within the recently completed Slipstream sculpture by Richard Wilson (RA), which traces the motion of a stunt plane as it joyfully cartwheels across 78 metres of space through the new Terminal 2 : The Queen's Terminal at Heathrow Airport. Created using techniques from fields as diverse as film animation, architecture, computer programming and – fittingly - aerodynamics and aerospace, Slipstream is formed by a vast kit of parts comprising over 45,000 unique pieces and 200,000 rivets; both a conscious echo and celebration of the golden era in aviation design. A digitally fabricated 1:18 scale facsimile of Slipstream forms the centrepiece of the exhibition, sitting alongside digital content and development models charting its journey from the take-off of an idea to its triumphant landing in the immense space of the terminal building. Using text, diagrams and models, the interpretative materials describe the featured projects from genesis to completion. Visitors will have the opportunity to explore the themes of the exhibition by assembling their own models from digitally fabricated interlocking components. The New Art Of Making exhibition gives a fascinating insight into an era of momentous change for the way we build, sculpt and curate the world around us. 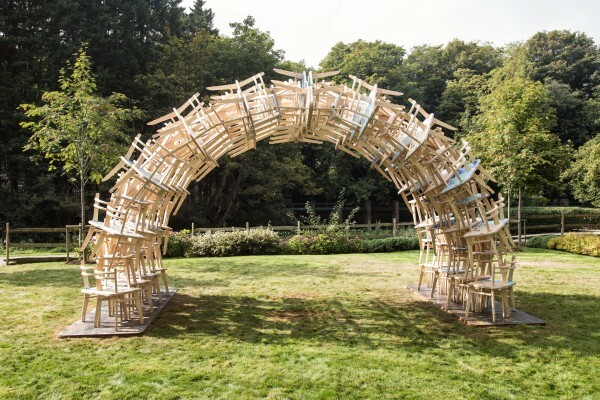 Due to the success and demand, 'The Last Chair Arch' has been extended by another week and will now be on display until teh 17th of October daily from 9am - 4pm. Go see it in High Wycombe - only this week until the10th of October. COME CELEBRATE WITH US AT THE GRAND OPENING. 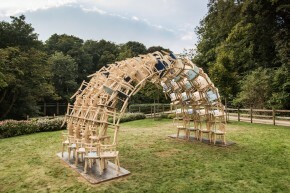 Over the past year public works has worked with residents of the Wye Dene, students and staff from Bucks New University and members from the furniture making industry to create a new Chair Arch for High Wycombe which will be realised in the Wye Dene. 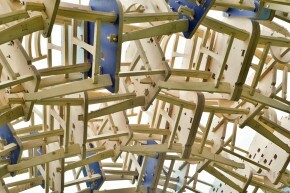 The chairs and arch will be assembled on site in Wye Dene with people from High Wycombe. The Last Chair Arch will remain on site for one week after which it will be dismantled and the chairs given away for free. Residents of High Wycombe are invited to become custodians of one or more chairs. 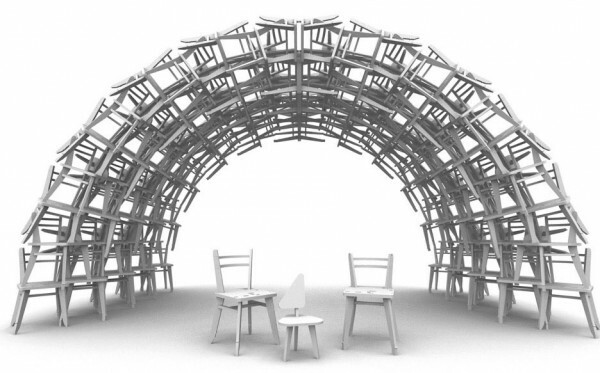 With no additional infrastructure required to form the arch, it is entirely possible that the chairs could be arched again in the future by the residents themselves. or use of power tools. We welcome anyone who wants to get involved or simply wants to drop by and find out more. No RSVP is needed and participants can join at any time. If you have any further questions please email public works here. public works for the Wye Dene development in High Wycombe. The project forms part of an art commission for Wye Dene, curated by Futurecity on behalf of Berkeley Homes. 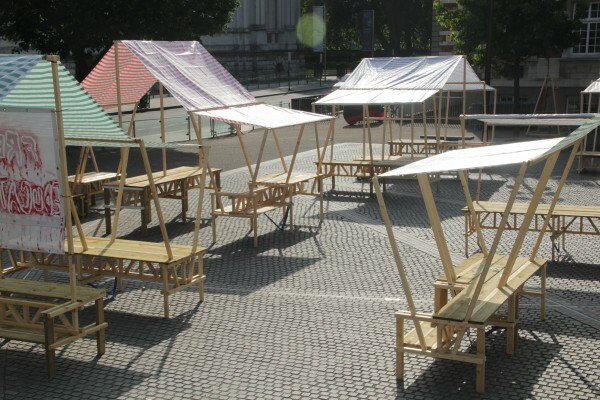 The market will feature 50+ stalls that explore existing systems of evaluation and actively produce new ones: a skillshare, organ donation, an economy of promises, commoners, a fablab, a bring your own BBQ, virtuous communities, bricklaying, an economy of promises, a speakers' corner—even a kiosk buying tears. Multiple currencies will circulate, not all of them monetary. Whilst the values of competitive markets dominate contemporary life, including art and its education, other kinds can and do coexist. #TransActing will nurture and celebrate these other value relations in a spectacular one-day event. #TransActing is organised by Critical Practice and designed in collaboration with public works. 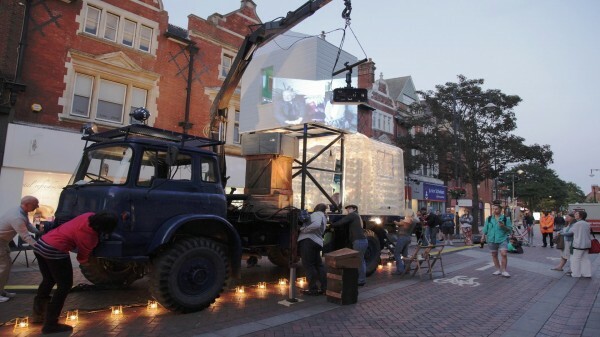 It's part of Camberwell, Chelsea & Wimbledon (CCW) Graduate School's public programme. How can we share knowledge and thoughts to create a positive vision of sustainable action and alternative ways of living? 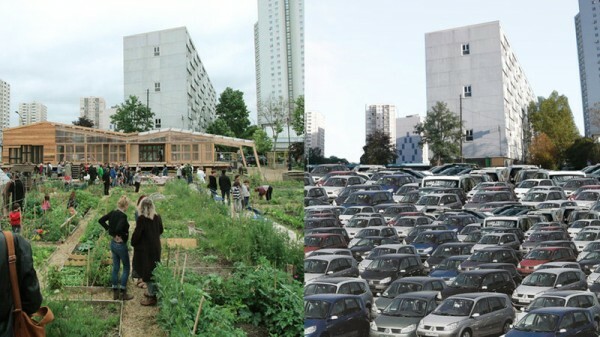 How do we understand the increasing privatization of public space? What is the public’s responsibility to address economic and social concerns within the city? 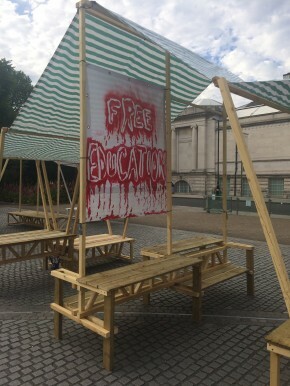 In response to the UK housing crisis, guest speakers Alberto Duman, Jane Rendell and Torange Khonsari each bring their own physical fragment of ‘evidence’ as a prompt to discuss the role of art, activism and architecture in politicizing, questioning and creating movements of resistance to this challenging urban context. In this event Duman explores the increasingly important activity of redaction against the backdrop of regeneration developments. Khonsari presents housing as an agent to public service, stimulating discussion of current planning laws and alternative housing models that negotiate between the private and the public. Rendell examines the spaces and voices of the Public Inquiry as a site of state bureaucracy, one which operates as a key part of the decision-making process concerning whether to demolish social housing estates. The speakers’ presentations are followed by a breakout session where you, the participant, are invited to bring and share your own forms of evidence. These forms of evidence could be photographs, objects, documents, anecdotes or memories that represent or relate to your experience of the housing crisis. 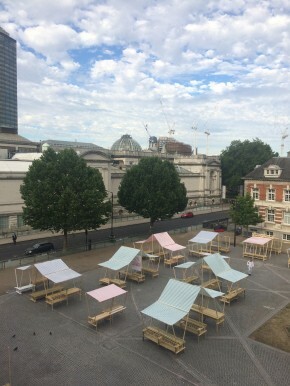 This event is part of the London Festival of Architecture 2015. Public works is collaborating with Critical Pracrtice on the latest iteration of the Market of Ideas to be held at Chelsea Collage on the the 11th of July 2015. We are seeking contributions to this international event in central London. 10 successful applicants will receive £100. 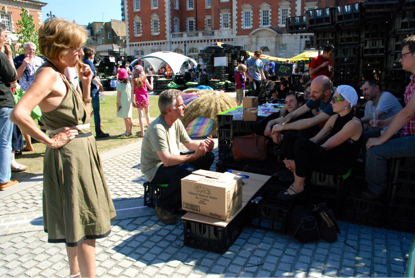 12-5pm on Saturday, 11th July 2015 in London, at Chelsea College of Arts on the Rootstein Hopkins Parade Ground, across from Tate Britain. 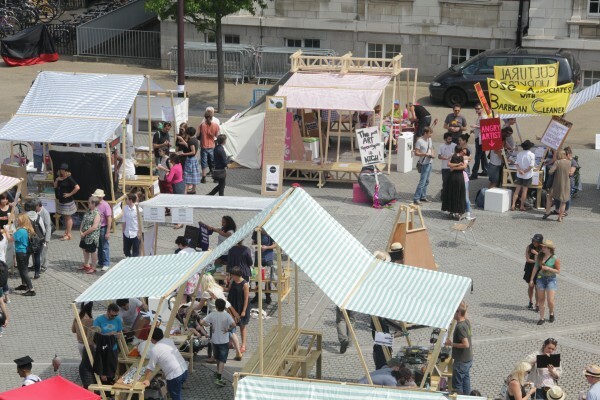 This bustling pop-up market will feature artists, designers, civil-society groups, academics, ecologists, activists and others who creatively explore existing structures of evaluation and actively produce new ones. Organised by Critical Practice, #TransActing will take place on the historic Rootstein Hopkins Parade Ground, located between Tate Britain and Chelsea College of Arts.Care, trust, creativity and generosity are forms of exchange that coexist with money but cannot be made equivalent to pounds and pence. The Market will showcase skillshares, repair hubs and hacklabs, organ donation, expert and enthusiast knowledge and other resources. Diverse forms of value production will animate economies beyond the financial. It's wealth beyond capital that will be produced at #TransActing. public works and others. These stalls will be interspersed with other spaces of assembly and exchange: a speakers' corner, a social cinema, while multiple currencies will circulate, not all of them monetary. Download the full call out here. 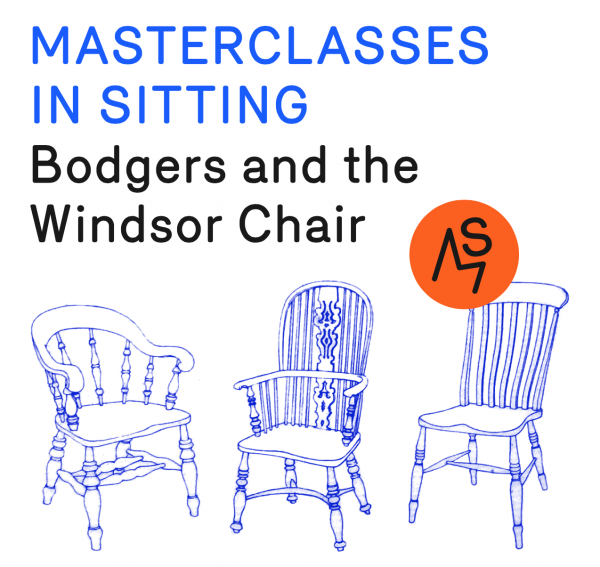 Join us for a free series of presentations by manufacturers, designers and historians to discuss High Wycombe's famous history of bodging and the Windsor Chair. Chairs for Arching, is a triptych of talks and discussions on the history of chairs and celebratory arches in High Wycombe. The first talk in the series looked at how the Chair Arches of High Wycombe have inspired designers internationally while locally serving as a symbol celebrating the town's industry and identity. The second event will take place on 17th of April 2015 at the Wrights Meadow Community Centre in Wycombe Marsh. It will explore the tradition of the Windsor chair and its evolution throughout the years. We will be joined by furniture historian Dr Bernard Cotton, artist and craftsman Stuart King and professor in furniture Jake Kaner. Each speaker will give a short presentation followed by an open discussion. public works will use the opportunity to present their proposal for the forthcoming Chair Arch made with a custom designed chair which loosely references the Windsor tradition. The final event of the series will coincide with the construction of the new Chair Arch on the new Wye Dene development. The event is part of Masterclasses in Sitting, an art commission lead by public works for the Wye Dene development in High Wycombe. Taking as the starting point High Wycombe's rich history as the centre for furniture production, public works proposes a project, which uses 'sitting' as a way of relating and connecting the new Wye Dene estate with High Wycombe, its past and future. The project is lead by Andreas Lang from the artist group public works, it forms part of an art commission for Wye Dene, curated by Futurecity on behalf of Berkeley Homes. Dr Bernard 'Bill' Cotton is a furniture historian who has pioneered the study of vernacular furniture in both the UK and in Countries where the British settled. He has travelled widely, often with his wife Gerry, to record the regional traditions of furniture made for the homes of working people , over a forty year period. His extensive archive is a major resource of design and social history information and his collection of some four hundred English regional chairs is now gifted to the Geffrye museum. His published work includes 'The English Regional Chair' (ACC. 1990 ). 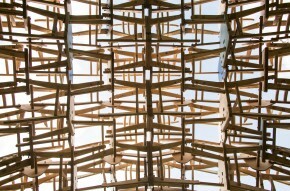 More recently he has completed his major work 'Scottish Vernacular Furniture' (Thames and Hudson. 2008 ) which for the first time identifies the chair and other furniture designs made there. He was co founder, with Christopher Gilbert, of the Regional Furniture Society and is presently the society's Emeritus President. Jake Kaner is professor in furniture at Bucks New University. 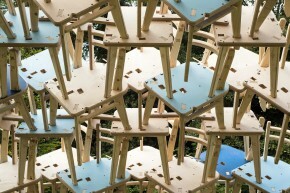 He has been involved with documenting the furniture industry through the curation of the High Wycombe Furniture Archive. Funding awarded form the arts and humanities research council supported the digitisation project which captured 16,000 images and text from the archive. The material covers the High Wycombe manufacturers, Ercol, Gomme (G-Plan) and Skull. The website that disseminates the material has been highly successful receiving an average of 100,000 hits per month since its launch in 2009. Currently Jake is working to digitise the William Birch archive in partnership with the Wycombe Museum. This material illustrates design books for art furniture that was made for Liberty's of London between 1890 and 1910. A further project involving the designs of Ib Kofod-Larsen, a Danish designer who worked for G-Plan in the 1960s, involves creating computer based models of furniture that was never put into production. Jake is also a trustee for Wycombe Heritgae and Arts Trust. Stuart King was born in the Buckinghamshire village of Holmer Green in 1942, and played as a child in the local Beech woods. The countryside and the trades and traditions of those that shaped it over centuries have always fascinated him and influenced his work. Stuart spent a lifetime researching, recording and collecting anything about the rural past and today is recognised as a well-known artist craftsman, demonstrator, international lecturer and photo-journalist. He is still actively recording traditional crafts, local landscape and history via photography and video and occasionally appears on TV. The MRC Laboratory of Molecular Biology (LMB) is pleased to announce the appointment of 30 Bird and public works as LMB Artists-in-Residence starting in April 2015. They are a collaborative team made up of a Cambridge based performance company led by Mehrdad Seyf (30 Bird) and a participatory art and architecture practice led by Torange Kohnsari (public works). They are ground breaking artists who will engage with members of the LMB with the aim to inspire new perspectives and understanding of the LMB's research, both amongst LMB staff, and the general public. The residency is scheduled to run over 12months. 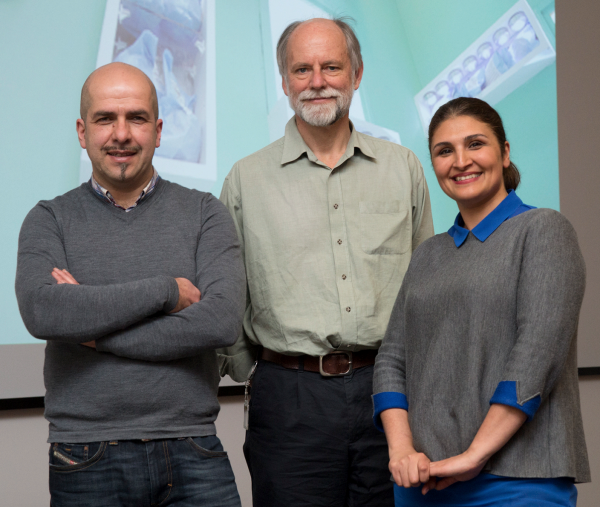 Mehrdad and Torange were selected by the LMB's Public Art Steering Panel, made up of LMB staff and external advisors, who were impressed by their enthusiasm about the LMB's science and their diverse and engaging response to the brief. The LMB is one of the world's leading research institutes, whose scientists are studying biology on a tiny scale to understand fundamental biological processes and diseases. "We were attracted to this residency because it provided us with the opportunity to bring together art and science in an innovative and interesting way challenging the more traditional notions of public art", said Mehrdad Seyf. He added "The research at the LMB involves work at the minutest detail, with the aim of extracting information that influences life on earth on an epic scale. It is the marriage of these two, the minute and the epic, the scientific research deep within organisms and its physical and social consequences that make the research at the LMB work so exciting to us." The LMB residency is the first in a new Artist-in-Residence programme that forms part of the Cambridge Biomedical Campus (CBC) Public Art Programme. The Programme is led and funded by property developers Countryside Properties and Liberty Property Trust under the s106 agreement with Cambridge City Council to deliver public art across the CBC expansion land. The Programme is curated and co-ordinated on the developers' behalf by cultural agency, Futurecity. A day of debate &provocationsexploringinnovation&collaboration across the artsandsciences. A day of debate & provocations exploring innovation & collaboration across the arts and sciences. Bolshevic Agitprop trains armed with public speakers, writers, stores of books and pamphlets and even printing presses: In her Peachy Coochy at JUNCTURES, architect Torange Khonsari from public works talks about performance, sculpture, architecture and their relationship to the political sciences.